Jeff Cauley, left, and his son, Joe, now run a used-car store that focuses on performance tuning and sales of late-model sporty cars. Jeff Cauley got plenty of advice last year after his Chevrolet franchise in the affluent Detroit suburb of West Bloomfield, Mich., was terminated. "I had so many people say, 'Why didn't you go after a Hyundai franchise? Why didn't you look at Kia?'" Cauley says. "Well, I don't want to sell Hyundais or Kias. I really don't. Life is short. And usually when you do things that you enjoy and you are good at it, it ends up working out." What Cauley, 50, is good at -- and what he loves -- is selling performance cars. Cauley Chevrolet was one of the top Corvette dealers in the country, consistently ranking in the top 1 percent of all Chevrolet dealers in that category. So what to do after Chevy? Cauley has converted the Chevy dealership into a used-car store, but it's one that specializes in high-performance models, along with what he calls "specialty vehicles" -- namely, Jeeps, all-wheel-drive Cadillacs and some luxury sedans. Meanwhile, Cauley remains one of only 35 Ferrari dealers in the country, selling the supercars from a modern building that showcases new and used models. Across a wide driveway from the Ferrari dealership is the former Chevrolet store. In the old days, it was known in the area for the array of new Corvettes parked out front. 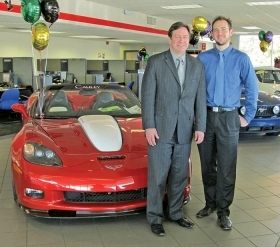 The former Cauley Chevrolet now specializes in high-performance models. In some years the Corvette was the dealership's No. 1 selling vehicle. Even after Cauley was notified in June 2009 that he would lose his Chevrolet franchise and was no longer allowed to order new vehicles, Cauley's Corvette sales ranked 26th in the country for that year, thanks to dealer trades. "We are trying to capitalize on our reputation for performance cars like Ferrari and Corvette and the reputation we have for racing," says Cauley as he talks about his new business model without Chevrolet. "In a lot of ways this whole thing is evolving," he says. "It is like 'Build it and they will come.'" Today, the former Chevrolet showroom is filled with late-model specialty cars, including a 2007 Ford Mustang GT, a 2008 Volkswagen GTI and a supercharged 2010 Callaway Corvette. The big, blue letters outside spelling "Cauley Chevrolet" are gone, replaced with "Cauley Performance Automotive." Cauley gives a lot of credit for the new business model to his son, Joe, 24, who is general manager. "Joe pushed," he says. "You've got to believe in and enjoy what you are doing." A Callaway Corvette sits with other performance cars in the showroom. 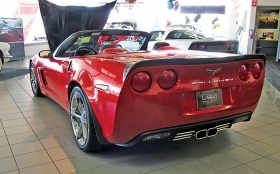 When it came to selling Corvettes, Cauley Chevrolet in suburban Detroit consistently ranked in the top 1% of all Chevy dealers before the franchise was terminated. Here's a brief history of Cauley. 1969: Cauley Chevrolet opens in Ferndale, Mich.
1978: It moves to West Bloomfield, Mich.
1999: A Ferrari franchise is added. 2010: GM terminates the Chevrolet franchise; Chevy dealership reopens as a used-car store, focusing on performance tuning and sales of late-model sporty cars. Jeff Cauley points to his Ferrari dealership, which opened in 1999. "When we built the Ferrari franchise, other dealers thought I had lost my mind," he says. "It was the smartest thing that I ever did." Last year 19 new Ferraris were sold. This year, based on presold orders, 32 will be sold by year end. New Ferrari sales are up because of a better supply of the new California models and a full year of production for the 458. "Ferrari owners are more insulated. The recession has not affected them as much as some," Cauley says. Besides Corvettes, loaded Tahoes, Suburbans and TrailBlazers were popular models when Cauley was selling new Chevrolets. Before the Chevrolet franchise was lost, the dealership sold about 1,200 new vehicles and about 350 used vehicles annually. This year, through October, Cauley sold 268 used vehicles, compared with 211 last year when it was in wind-down mode. Cauley's new business model targets a local community in metropolitan Detroit where imports do well. "We are going after late-model specialty vehicles with unique flair," he says. "Every manufacturer has something special. It could be the Subaru WRX. It could be the Nissan GTR, the 370Z, the Audi TT, the Mini Cooper S.
"We are taking all of the unique vehicles of all the different manufacturers and trying to make it a one-stop shop," he says. Jeff's father, Jack, opened the Chevrolet dealership in 1969 in Ferndale, a suburb northwest of Detroit. He moved the dealership farther out to West Bloomfield in 1978. Jeff became a co-dealer principal in 1988 and took over the store in 1993 when his father retired. An interest in auto racing developed after Jeff graduated from college in 1983, beginning behind the wheel of a single-seat Formula Ford race car and moving on to Corvettes. Jeff and Joe race at tracks in Michigan and elsewhere. A Cauley-owned Corvette participated in the 24 Hours of Daytona in 1999, 2000 and 2004. "There was a point early on with the whole Chevy thing -- before I realized it was something you could fight -- when Joe and I were strategizing, looking at buying a race track," Jeff Cauley says. Cauley fought for unconditional reinstatement of the franchise. Over the years, the dealership ranked No. 1, 2 or 3 in customer satisfaction for the Detroit area, he says. But several Chevrolet stores were cut by General Motors in the overdealered Detroit market. "We had a backup plan and were ready" in the event GM failed to approve a Chevrolet franchise, he says. But until Oct. 31 of last year, when the franchise expired, Cauley kept his hopes alive. "I was battling up until the last minute," he says. "It was like: Reverse this thing now; it is not too late." At first, remaining hopeful, he trimmed the number of his employees only slightly, down to about 50. The business did not shut down for the transformation to Cauley Performance Automotive. The Chevrolet store closed Oct. 31, painters went to work and a temporary sign was erected. "If you are starting this from scratch, you start with a very few number of people and you would add as you go," Cauley says. "We were not doing that. We were starting from a full-fledged Chevy operation." Cutting the number of employees "was a very difficult process." Today, he employs 24 people at the used-car operation. With the loss of Chevrolet, Jeff Cauley touts performance tuning, an automotive business he and his son developed over the past year. The dealership builds high-horsepower engines, installs superchargers in existing engines and modifies suspensions, some for amateur racers. An Edelbrock supercharger with installation costs about $9,500, giving a base 430-hp 2012 Corvette about 600 hp, for example. "It is really everything from A to Z," Joe says. "We have an old hot rod where the owner asked for power brakes to be installed." Meanwhile, the Cauleys are seeking more business for the body shop. Two additional insurance companies have approved the shop for repairs, and a third is expected to do so. Jeff says business at the former Chevrolet store is tough. He hopes to break even some time next year. "There are some times when you miss Chevrolet and everything that we put into it," he says. "There is another part that I love: the idea of controlling our own destiny -- doing our business the way that we want to do it. "Yeah, some mixed feelings," he says, "but all in all, we are not looking back. Who knows what opportunities the future will hold?"